Blood is one of the most vital components of life. Without it, life-giving oxygen wouldn’t get transported through the body and waste products would build up to toxic levels. It is truly a miracle of modern medicine that we can so easily transplant this vital substance from one person to another. But before this can happen, someone must care enough to share their good health with others. There are several different ways to give blood, and every one of them provides an opportunity to save a life. As a regular donor and life saver, you are entitled to sign up for a special acknowledgement program just for you. The Life Points program offers awards for your continued help. Sign up today and start earning Life Points! The major source of blood and blood components in the United States comes from volunteer whole blood donors. These donors freely give blood to the blood center for use by patients. Whole blood donors may donate one unit of whole blood every 56 days. Being a whole blood donor is safe, simple, and very fulfilling. You can help as many as three different patients with just one donation. The entire whole blood donation process takes about an hour. Blood cannot be manufactured. Individuals who give blood ensure that an adequate supply is available – possibly saving someone’s life. Get a good night’s sleep and drink plenty of extra fluids prior to your donation. Eat a well-balanced meal approximately two to three hours before donating. Never attempt to donate blood on an empty stomach. You can play an important role in our community while making a difference in the lives of patients – and you can do it by making fewer visits to the blood center. Double red cell donations allow you to give enough red blood cells for two transfusions in a single visit. The process, called apheresis (A-fur-EE-sis), involves the use of a medical device to harvest a super dose of packed red blood cells. Your platelets and plasma are returned during the procedure, along with saline solution. Because of the fluid replacement that donors receive during this procedure, many report feeling better after a double red blood cell donation than after a standard whole blood donation. When you give a double red blood cell donation, you are also assigned extra LifePoints to acknowledge your gift. Double red cell donors must meet the same requirements as whole blood donors, in addition to having a higher iron level (hematocrit) and different height-to-weight ratios. Because donors give twice as many red cells during this procedure, the deferral period between donations is twice as long – 112 days. The process is really not much different than a whole blood donation. After completing the medical history, double red cell donors have a seat on a comfortable lounge chair. 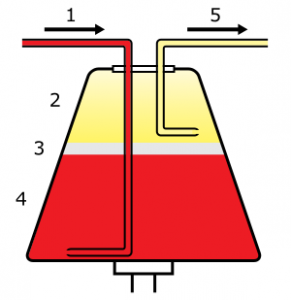 A sterile, single-use blood collection kit is installed onto the apheresis instrument. Many donors are pleased to find out that the needle used for the double red cell procedure is actually smaller than the one used for whole blood. During the procedure, the instrument removes the red cells and returns the platelets and plasma to the donor – along with saline solution to replace the blood volume removed. The actual donation takes around 25 minutes – or 10-15 minutes longer than a whole blood donation. After giving, donors are encouraged to enjoy some refreshments in the canteen area. Apheresis (A-fur-EE-sis) is a special kind of donation that allows a donor to give specific blood components, such as plasma or platelets. Apheresis donations are available only at CBCO fixed site donor centers. Blood is a mixture of red cells, white cells, plasma and platelets. During an apheresis procedure, blood is drawn from the donor’s arm through sterile tubing into a specialized instrument which separates the blood into components. The desired component is collected in a special bag, and the remaining components are returned to the donor. Apheresis donations allow CBCO to carefully control our inventory. It is our goal not to waste a drop of this precious community resource. Apheresis donations give us the ability to manage the flow of blood to our area hospitals, maximizing your donation! During platelet or plasma apheresis, blood is extracted from the donor’s arm and mixed with a solution to keep it from clotting. Then it goes into a sterile disposable set installed on the blood cell separator. When the blood is in the separator, platelets or plasma are removed. The other blood components that are not being collected are returned to the donor. The procedure takes approximately one to two hours to complete. It is longer than a regular donation because it takes extra time to separate the blood components and collect the component. These specialized donations are needed daily to replenish the supply. Platelets are actually fragments of a larger cell, called megakaryocytes. When a blood vessel is damaged, platelets rush to the site of the injury and temporarily repair the tear. Platelets then activate substances in plasma which form a clot and allow the wound to heal. After someone donates platelets, they may only be stored for five days. Many lifesaving medical treatments require platelet transfusions. Cancer patients, those receiving organ or bone marrow transplants, victims of traumatic injuries, and patients undergoing open heart surgery require platelet transfusions to survive. More than 8,000 platelet apheresis donations are required here in the Ozarks each year. Because they can only be stored for five days, the supply must be constantly replenished. Plasma is the pale yellow liquid portion of your blood that can be easily replaced by the body. It consists mainly of water and proteins, which help your body control bleeding and infection. Plasma products are used by burn, trauma and cancer patients. Plasma is needed every day in our area hospitals. By giving plasma through an apheresis procedure, you are able to donate more often than with a regular whole blood donation – every 28 days. Yes, apheresis donations are very safe. 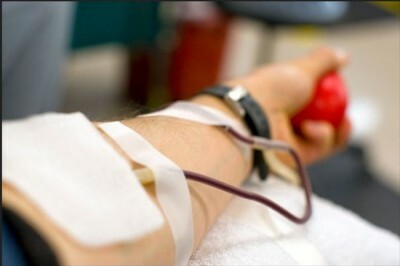 The procedure uses a smaller needle than a whole blood donation, so you might find it more comfortable. Many donors report feeling better after an apheresis donation compared to a whole blood donation, because they receive a small amount of sterile saline fluid to make up for the blood volume loss. Each donation is closely supervised by trained staff who observe the donors throughout the process. Only a small percentage of your platelets or plasma are collected, and your body will replace them within 48 hours. The donation equipment-needle, tubing and collection bags-is sterile and discarded after each donation, making it virtually impossible to contract a disease from the process. How Can I Become an Apheresis Donor? Community Blood Center of the Ozarks takes platelet apheresis donations only at our fixed site donor centers in Springfield, MO, and Springdale, AR. If you want to save lives through apheresis, please give us a call at 1-800-280-5337 for more information. There are times when your physician may prescribe blood transfusion for a planned surgery or procedure. CBCO can assist with preparing for this process through our Special Donations Department. Autologous (aw-tawl’-o-gus) blood donation is a procedure in which you give blood for later transfusion to yourself. Directed blood donation is a procedure in which a friend or family member donates blood specifically for a patient, with a doctor’s orders. Therapeutic blood donation is a procedure for individuals with a medical condition requiring phlebotomy. Conditions like polycythemia or porphyria cutanea tarda may require patients to have blood drawn as a form of treatment. These procedures require a doctor’s order. Donors with hereditary hemochromatosis who meet all suitability requirements for allogeneic blood donations may donate blood for the general blood supply. These donors will be allowed to donate blood more often than every eight weeks and their blood may be used for transfusion if otherwise suitable. There will be no fee for phlebotomies performed on individuals with hereditary hemochromatosis whether or not they meet requirements to be allogeneic donors. For more information on Special Donations, please contact the Special Donations Department at (800) 280-5337.